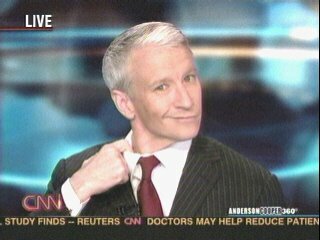 I enjoyed snarky Anderson tonight, including his impersonation of Star Jones. What I don't enjoy is the coverage of two professional women publicly disrespecting each other. Doesn't really matter who's right or wrong, what does matter is that we need to work together with dignity. Divisiveness gets us no where. And one final observation. I knew it was too good to last, Mr. Cooper never mentioned Arizona once tonight. I've come across some new (to me) Nth degrees, that I will be sharing over the next few days. Hope you enjoy! Tonight, taking graciousness to the "Nth Degree." You know what, she really is the ultimate hostess. Martha Stewart we mean. A wonderful story in today's Wall Street Journal recounts the things she's done in prison: taught those in the slammer with her how to weave, giving them pep talks and financial advice, conducted seminars on sentencing guidelines, made a beautiful floral decoration for the memorial service of a deceased guard. Talk about making the best of a bad situation. And be to get along with just about anyone at all. With all due respect to Condi Rice, think what Secretary of State Stewart could do. She'd have Iraq Sunnis and Shias working peacefully together sewing up a big patchwork quilt. Kim Jong-il would join her in the kitchen to cook kimchi, and forswear nuclear menace. She'd organize a conga line for Syria's troops and dance them right out of Lebanon. And just imagine Israelis and Palestinians making gingerbread houses together. Diplomacy, it's a good thing. And having settled those other old and terrible enmities, maybe she can take on one of the worst of all, the one between Republicans and Democrats. Actually, nah. That be too much for even Martha Stewart. As most of you know I've been gone for a few day due to a death in my family. I'm not sure if my heart is in blogging yet, but it is most definitely touched by all the emails and comments I've been privileged to receive from so many of you. Some were warm cyberhugs (always appreciated) and some shared with me your own stories of loss and how you cope. I am most grateful to each and every one of you. I have never felt more encircled with friends than these last few days. Thank you all so very much. Did anyone notice how hard Anderson was trying to cheer me up tonight? Even if I am delusional, he really did make me smile. From the new ugliest dog in America (Arizona) to the Grand Canyon forest fires (Arizona) to talking to my second favorite newsman, Mike Watkiss (Arizona) about polygamy, and even (judging by the background scenery) the parents of the cruise ship missing woman appear to have been from Arizona. Really, Anderson, I'm thinking 360 needs an Arizona bureau office and I'd like to be the first to apply for a job. 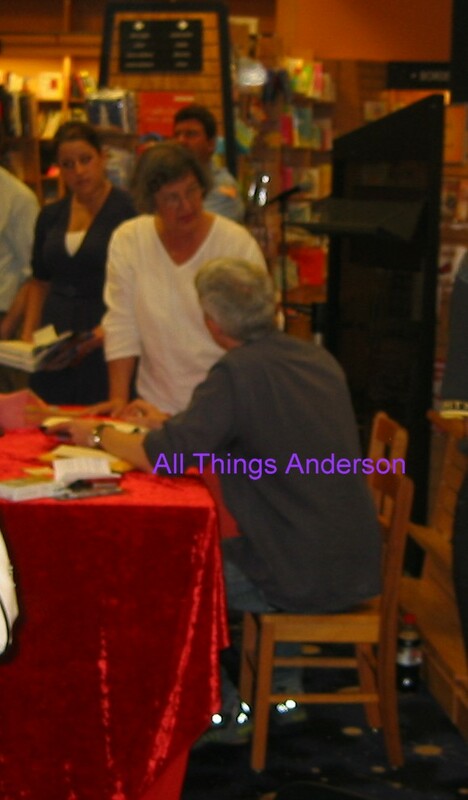 We received some pictures from Monday's Book Signing at Borders in NOLA. He came in dressed in his casual "field" clothes and spoke for a few minutes before signing books. Crowd estimate was approx 300-400 but many were turned away because they ran out of books! Can anyone guess the location of the last picture? ETA: The woman in the first picture is related to Anderson and was given a big hug! CNN Theater presents "The Smurfs"
Far, very far from here, in a little village full of mushroom-shaped houses live the Smurfs. The little characters are three apples high, have blue skin and are dressed in white trousers and a cap. Yet they are a happy, easy-going bunch - give or take one or two. As for the character description, it comes straight from the official Smurf's website (trust me I could not make it up any better!). So without further ado here is All Things Anderson's recasting of "The Smurfs". Papa Smurf will be played by Wolf Blitzer. "You can recognize the village leader by his white beard. 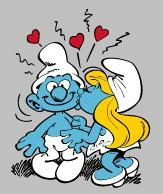 Papa Smurf is no less than 542 years old - and no more either. He uses his wisdom to advise rather than tell people what to do. He often rescues the younger Smurfs from danger." Grandpa Smurf is the oldest of all Smurfs and is played by Larry King. "His energy and enthusiasm are impressive. Besides wearing bright suspenders, Grandpa always wears glasses. He's an avid storyteller and loves to show off some of the souvenirs he has collected during his travels." 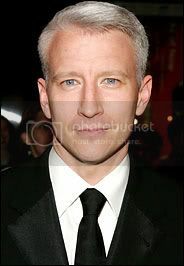 I had to take a little poetic license with Brainy Smurf, played by Anderson Cooper. Brainy is a Smurf that takes smurfing very seriously. He is exceptionally smurfy with the snarky comments and finds that Smurf blue suits him very well. 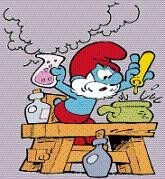 "The wicked Gargamel originally created Smurfette to stir up trouble in the village. But Papa Smurf's magic turned her into the charming little Smurf that everyone adores." The lovely Kyra Phillips will be portraying Smurfette. "No matter what anyone says, Grouchy is against it. He grumbles and mumbles and always thinks negative. But underneath it all, he's a softy, but he'd hate it if people knew. " Sounds perfect for Jack Cafferity. 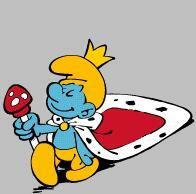 "The Smurfs leader puts on a crown, an ermine coat, takes a sceptre and calls himself King Smurf." Seems an appropriate role for Jon Klein. "Living in a dilapidated hovel on the edge of the forest, Gargamel the horrible sorcerer is evil, cunning and two-faced wizard. He hates the Smurfs and is constantly in pursuit of them but the Smurfs always outwit him and manage to escape. 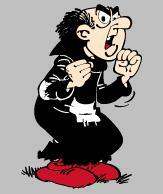 After each setback Gargamel swears he shall be revenged." Even I am not mean enough to cast a CNN anchor in this evil role. Gargamel will be played by Bill O'Reilly. "The Coolest Lady on the Planet"
Hi All! Strange seeing me post here at All Things Anderson, huh? Well, Phebe and her wonderful team were nice enough to let me post my thoughts on their blog while Phebe is away taking care of her personal life. First, I wanted to express my deepest sympathies to you, Phebe. I know what a rough year this has been for you and now at the end of your mother’s journey, I hope that you reflect on all of the wonderful memories you and your mother have shared throughout the years. I’m sending you big hugs from over here in Jersey! In times such as these we should take a moment to appreciate our loved ones and reflect on how much they mean to us. I thought today I would tell you a little bit about my mother and what a wonderful relationship she and I share. My mother is my best friend. She has been there for me through some of the very best and some of the very worst times in my life. I cannot tell you how much I cherish her and our close relationship. 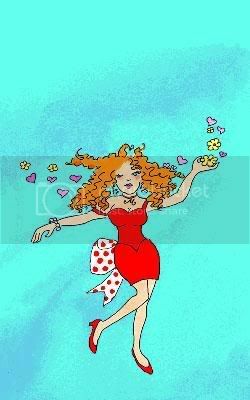 She’s beautiful, intelligent, sweet, kind, caring and everyone who meets her instantly loves her! She can talk to a wall! (remind you of anyone you know?) She’s funny but not in the comical sense. She's so naïve that her reactions to things make you roll on the floor laughing! My father once told a naughty joke at the beginning of summer one weekend at our shore home. It wasn't until the very last day of summer, while we were all playing cards, that she suddenly looked up and said, “Now I get it, the Fugowee Tribe!” It took her three whole months and a lot of internal conversations to get the lamest dirty joke on the planet. I nearly died laughing. My ribs literally hurt! Tiny snippets of time like the one above will be etched in my memory forever. I remember her playing cards with my brother on snow days. I remember where she stood each day peering through the window, watching us walk off to school. She didn’t leave that window until it was impossible to see us anymore. She was always there everyday when we got home, waiting (usually to yell at me for my dirty room!) for us to return safely. I know that I am lucky. We’ve survived childhood struggles, teen angst, countless mistakes, moving out then moving back home, rivers of tears from loves gone bad and anything else that can come between a mother and a daughter. We’ve become confidants, friends and most of all she has helped me become the mother that I am today. “Once my mother gave me a silver bar on which was printed What would you do if you could not fail? – meaning, don’t make decisions out of insecurity. I know that people have been leaving messages for Phebe at the ‘Sphere. Please feel free to leave your message here in the Comments section. I’m sure she will read each and every message. Anderson has attended high-society parties in New York meeting the rich & famous and for the past few years we have seen him at the Vanity Fair Oscar party. Admittedly, he isn't a fan of celebrities and finds some of these parties boring. After mentioning in several interviews this week that he was flying to Mississippi this weekend to attend the Cooper family reunion, I got the impression he was more than excited to attend this gathering. Unlike the Hollywood soirees, Anderson can throw on a polo and shorts, kick back, and relax while catching up with family he probably hasn't visited in awhile. The similarities and resemblances among us, or the lack of them, were discussed, analyzed, and compared, as were our virtues and our failings. 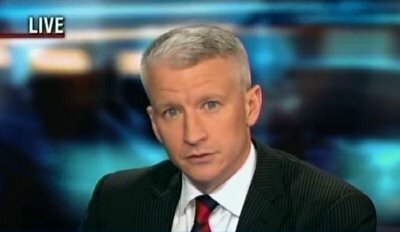 It was agreed, for instance, that my nose and my conceit were pure Cooper but that my coloring and quiet manner came from the Andersons, my mother's people. I was considered lucky to have inherited a head shaped like that of Grandpa Cooper - it stuck out behind something like the back end of an old-fashioned hammer. I shared this inheritance with only one of the dozens of Cooper cousins, and it was assumed that with it went Grandpa's brilliant mind. We were, accordingly, expected to do the family some credit. In the case of my cousin, Frank Rose, the assumptions found fulfillment, either because there was somethig to the idea to start with or because the expectations spurred him on to notable achievement. In high school he was already dazzling; as good-looking as anybody you'd ever want to have around, as popular as a movie star, a top athlete and a top scholar, he was elected president of any campus organization he happened to saunter near. By the time he was twenty-nine he was president of a college, and later performed brilliantly as President of the University of Alabama during years of intense crisis*. Time and Life magazines might have been impressed, but there was nothing remarkable about it to my aunts. To them the honors paid him had nothing to do with hard work, clever planning, or diligent study. It was just Grandpa's head, that's all. With that head, what did you expect? As for me - well, my head never did jut out as far as Frank's anyway. It would be interesting to see a family photo from the reunion to see what other resemblances there are between Anderson and the Coopers. *Frank Rose was president when University of Alabama was desegregated in 1963. On Monday, is Anderson's final NOLA book signing: Borders, Metairie, 12PM and he is the Keynote Speaker at the ALA Conference in New Orleans, 5PM. 18,000 are scheduled to attend. This is the first big conference to come to NOLA after Katrina. These and other appearances in the coming weeks can be found on Anderson's Funhouse Calendar. For those of you attending the New Orleans book signings this week, travel safely. How did you come to belong to the Andercommunity? I've been giving that some thought lately and I wonder if all our reasons are as unique as we are? It began for me when the worries in my life were becoming overwhelming. You see my mother has Alzheimer's. I'd never know anyone with Alzheimer's and I wasn't handling it very well. My mother was handling it beautifully, she just kept right on going. Never worried about who would take care of her, where she would live, how bad it would get. Nothing seemed to phase her. I, on the other hand, was what they kindly refer to as a basket case. I went into hyper-drive making sure that she had someone to clean her house, pay her bills, cook her meals, wash her clothes, etc. I even had someone to stay with her at night, so she wouldn't be alone. And still I worried. During this time I had my own family to care for, a job to try and concentrate on and lots of commitments. When the day was over, I often sat alone in the dark wondering if I had the energy to start it all over in the morning, or if I even wanted to. Then one night, after everyone was asleep, I turned on the television as a distraction from my nightly worries. I've always been a news junkie, but circumstances had caused me to pay less attention to the world's problems and focus more on my own. I found myself loving the escape from my world and catching up on the events of the day, once again. 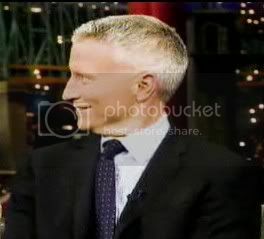 I enjoyed the calmness of Aaron Brown, the snarky humor of Anderson Cooper, the whole cast of CNN characters that entertained me nightly and helped me to forget, for a few hours, how difficult life had become. My husband began to tease me about my television boyfriend, but secretly he was happy that I had found something to look forward to. Eventually, I started searching the internet for information on these new television friends. I wondered what worries affected their lives, did they have Alzheimer's in their family too? It was during this search for information that I came across a fan board. On this board I found people who wanted to talk about frivolous stuff. What was you favorite AC tie, was that a fresh haircut, was Anderson flirting with Erica, you know, just fun stuff. I began to look forward to talking to my internet friends every night. That was huge, I hadn't look forward to much for a very long time. To these women (and a few men) I wasn't someone's wife, someone's mother, someone's daughter, I was me, Phebe. These internet friends helped me through the deterioration of my mother's health, more than they will ever know. They have made me laugh and shared my sadness and tears. My mother died yesterday. It's been a very long, very sad journey. And to my friends in the Andercommunity thank you for being there. It truly made a difference. It was a Breaking News night on 360 Thursday. When there is a single topic night it makes blogging a little difficult. Nights like this are when Anderson is at his best. Breaking news really gets his adrenaline flowing, or so it appears to me. Time will tell if the story was worthy of 2 hours of coverage or not. If you stuck out the entire 2 hours you got a really entertaining interview by John Zarella, at the end of the show, with a member of the group being investigated by the FBI. I did have to laugh at Anderson, safe in the studio, feeding John questions to ask this supposed cell member, as they stood in a rough neighborhood in Miami. John handled himself very well and Brother Corey probably will regret answering those questions for all the world to hear. One final note, Anderson did not say 'see you tomorrow night' as he usually does. Might have been because things got a little rushed at the end of the show but it is possible that he will take tomorrow night off. He did say he was attending the Cooper family reunion in Mississippi on Friday. Wonder what he'll bring to the potluck? 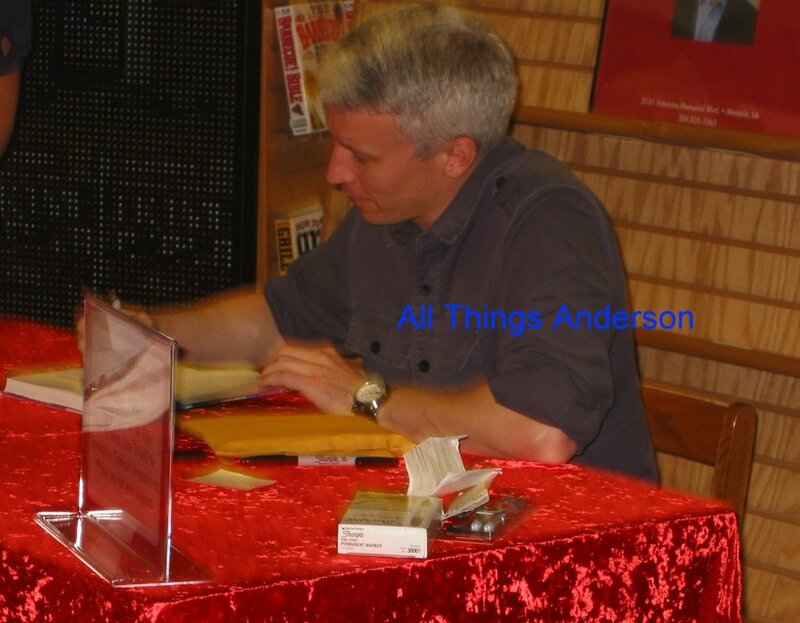 Anderson attended a fairly unpublicized book signing, on Thursday, at Bergdorf Goodman in New York City. More pictures (and larger ones too) at Patrick McMullan. Thanks to Xtina for the find. And while I'm posting Xtina's picture finds, here's one more that I find so adorkable. 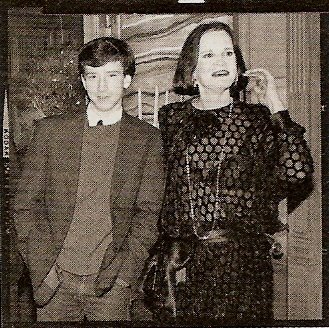 This was taken of Anderson and his mother, Gloria, at a party in the mid 1980's. Notice even way back then AC was shoving his hands into his pockets. Tonight, for me, was a more enjoyable show, than last night. It's always a difficult balance to oppose this war and support out troops. What a wonderful way to show that you appreciate our young men and women. As for Cher, her sincerity was obvious, but I really can't look at her without thinking of Jack McFarland on Will & Grace! Two very famous women using their celebrity for the good of all. I'm glad Anderson brought us both stories. 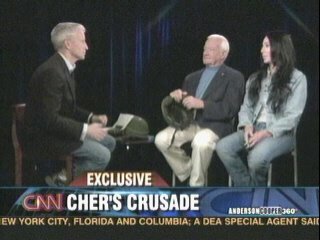 Here's the link to Cher's helmet site. Take a look and do what you can to help. If you hate this war it's still important to support our troops. Did you notice that CNN has sent Rick Sanchez to cover the fire in Sedona? I was thinking that because of this there would be no more Mike Watkiss. Wrong. AC is starting to enjoy Mike as much as I do. I thought, for the last segment we'd see Mike and Rick, but maybe CNN realizes that could be a dangerous combination. 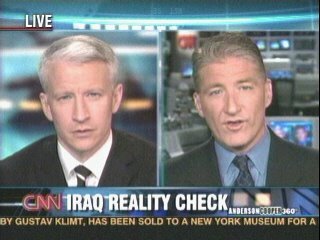 Both are reporters in the Geraldo mold and who knows what trouble they could get into if they worked as a team? Something to look forward to. 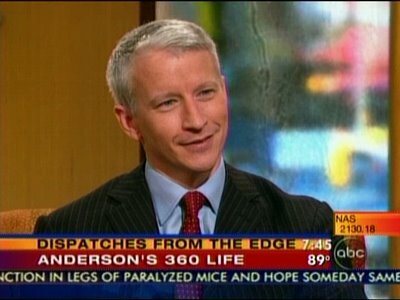 If you missed Anderson on Good Morning America this morning there wasn't much new information discussed. 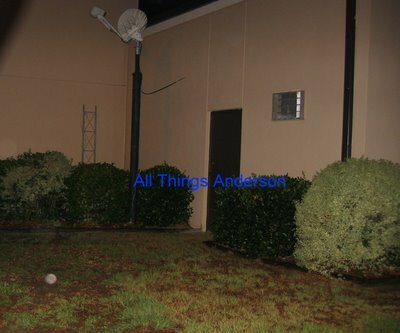 Anderson did reveal that he was attending a Cooper family reunion in Quitman, Mississippi this weekend. Don't forget if you're in that part of the country he has 3 book signings in the NOLA area this weekend. ATA has several readers that have promised reports, I'll post them, if they send them. 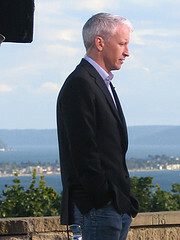 Anderson finished his television appearances for today on The Daily Show. From what I've been reading there were lots of giggles. It's not on here for another hour and I've had a long day. I'm going to set the vcr and watch it in the morning. It's time for the bonus Big Brother Blog. Tonight was the first episode of BB7 and we were introduced to the former houseguests that we can vote into this years house. Two of my all time favorites, Marcellas and James, were there but I was disappointed that Will Wikle and Curtis were not among the candidates. To vote go here. The results and the series will get started on July 6th. I've got some issues with Angelina Jolie, that I admit, but I was very impressed with the dedication and humanity she showed in her interview with Anderson. As I watched, I realized that it's the message that is important, not the messenger. And the message got through loud and clear. To paraphrase Anderson's blog 'we need to walk the walk, not just talk the talk'. So with that in mind I am including the information on where to contribute and hope that those of you who can, will. Here's the link to UNHCR. I don't think that I've ever blogged about my trip to Africa. Tonight, listening to AC and Angelina, brought back some memories. We landed at a fairly modern airport, complete with baggage carousel. When the baggage started to tumble down the ramp it was easy to find our matched set of Samsonite. We were the only ones with luggage, everyone else had bedrolls that contained their clothes. It was quite the culture shock. We were in northern Africa. It's much safer there, with less poverty than the Congo or Darfur, but it's still a world away, both literally and figuratively, from our lives in the United States. One of these days I'm going to dig out our pictures with the camels we rode. Our camel experience was very similar to the one Anderson mentioned after his recent vacation to Morocco. Here are a few screencaps by bcfraggle from the interview. Happy Hump Day! And a blogger bonus don't forget tonight is the premere of Big Brother's All Stars! Lots to cover tonight so I'll just jump right in. It was great to see most of my favorites on 360 tonight. We had a little bit of 'good' John, some Sanjay and Peter with his new haircut. I, for one, will be very glad when THE INTERVIEW is over tomorrow night. I'll try biting my tongue about Ms. Jolie but don't count on it. Blogger is giving me fits tonight otherwise I'd be posting some pictures of the man who should have been our President. 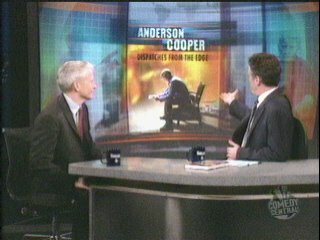 AC and Al Gore had a great few segments together, especially the discussion of Cheney. I also enjoyed Mike Watkiss, local Phoenix reporter, doing a report on the AZ. wildfires for 360. 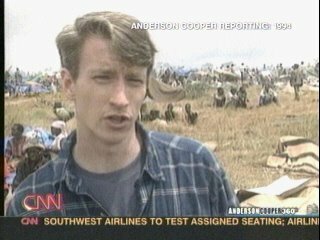 Most of you remember Mike as the expert Anderson turned to for information on Warren Jeffs, the polygamist. Mike is a personal favorite of mine, and a really good reporter. Loved the Grateful Dead reference, not sure if AC 'got' it or not. Here's some pictures of Anderson's book signing at the Time Warner building Monday, taken by bcfraggle. Anthony, at Anderholics, gave a nice little account. Sounds like there were around 300 people there, including Gloria Vanderbilt. Anthony was on the ball when he spotted Gloria and managed to get an autograph. 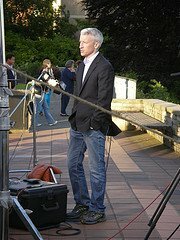 I'm also posting a few of the pictures from Bree, who tracked AC down in Seattle, as he broadcast 360 on Friday night. And, just in case you checked my blog early on Monday, and missed it, Anderson finally answered the questions for Ross Mathews Celebrity Pop Quiz. Check it out.